> Gift of General ONYX! General ONYX Snus is the Top of the General Snus Line. 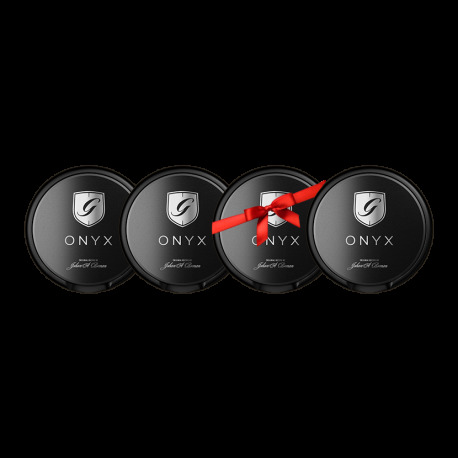 Reward that special snus lover in your life with four cans of the world-famous General ONYX Strong Portion Snus at a SPECIAL PRICEâ€¦.or reward yourself: Charity begins at home, you know! General ONYX Snus is the Top of the General Snus Line. Reward that special snus lover in your life with four cans of the world-famous General ONYX Strong Portion Snus at a SPECIAL PRICEâ€¦.or reward yourself: Charity begins at home, you know! General Onyx is the flagship of the General Snus family and the only super- premium production snus available. ONYX is a portion snus with pure tobacco flavor and elements of Roasted Lemon, Black pepper and salt. this is a very good high quality snus that tastes like a more refined general orignal or white. still has some bergamot and tobacco spice to it, but a bit more rounded. the black pouches are pretty cool looking, and very comfortable. i am new to snus, and i keep hearing about leaving it in for like two hours and my thought was always "nope. that's crazy" as i usually only last abotu 45 mins. i have had the current portion in for one hour and 45 mins and i'm still digging the flavor and getting a bit of nicotine. excellent stuff. i'm glad i blindly got the four pack, and i'll be getting a roll on my next order if i feel the same about the rest of the can.